By 2080, the world's lakes will experience a temperature change of up to 6.7c caused by greenhouse gas emissions, according to a study by the uk-based Tyndall Centre for Climate Change Research. The study, presented at the eighth international Living Lakes Conference in England, states that climate change directly affects lake levels, water temperature, thermal stratification, water quality, productivity and biodiversity. In Lake Baikal, the world's largest lake, warming in both winter and summer is expected to be faster than the global mean, reducing the period of surface freezing during winter. More frequent extreme temperatures in summer and less winter freezing could affect species in other lakes. 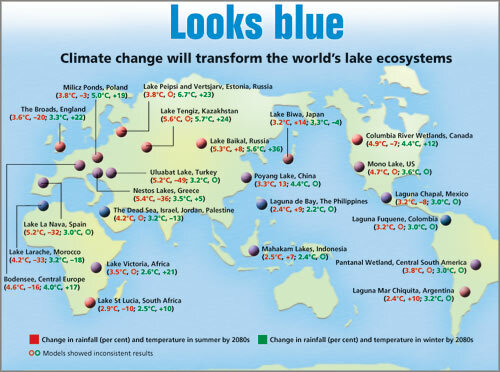 Unabated global warming will increase surface water temperatures, thus influencing thermal stratification in lakes. All the 23 lakes studied will be considerably warmer by 2080s -- more than 2c -- in the two seasons. A higher surface and air temperature will also increase evaporation of water causing a fall in lake levels unless offset by rainfall increase. Some lakes, like the Broads, a series of low-lying man-made shallow lakes located near the coastline in England, will face rising sea levels. Saltwater incursion in Lake Larache in Morocco will disrupt freshwater and inland habitats, affecting migratory birds. Lake La Nava, in Spain, could visibly dry up , as would wetlands in the catchment area. Water levels in spring may rise in case of lakes fed by snowmelt rivers, due to earlier and faster spring thaws. For instance, in lake Biwa in Japan, warmer spring temperature may bring forward and quicken snowmelt rate in mountain streams, which in turn may enhance flood risk. Poyang lake, the largest freshwater lake in China, is a natural overspill reservoir for the Yangtse river and more summer rainfall can increase river flow and floods. Rainfall in the region may increase by 13 per cent, quite a large increase in absolute terms. The scenario predicted pertains to a future world dependent on fossil fuels which will result in carbon dioxide concentration of 850 parts per million (ppm) by 2100. Present atmospheric concentration of carbon dioxide is about 370ppm. According to the study, if carbon concentration could be kept below 600ppm, a warming of about 2c by 2080s will happen, instead of 3.2c for 850ppm. In that case, climate change seen in the lakes would be reduced by 30-40 per cent. The study used nine global climate models to assess change in mean temperature and rainfall for the period around 2080s (2071-2100) relative to average 1961-1990 climate.